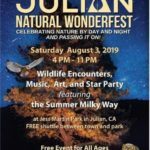 The Julian Wonderfest Committee is gearing up for a 2nd event on August 3, 2019, in Jess Martin County Park in Julian. The event will begin at 4 p.m. this year, due to the heat, and end at 10 p.m. This is a Free family-friendly event and it is free for exhibitors, as well. We celebrate backcountry nature by day and night: flora, fauna, land, and sky. An exhibit about fire prevention in the backcountry would fit right in! Astronomers, music, and nature talks take over the evening.